The faster that Illinois can retire its aging, inefficient coal plants, the better. Clean energy is poised for growth in Illinois. Thanks to legislation passed in 2016, the state enjoys strong renewable energy policies, and boasts an enviable 4,464 megawatts of wind power—the sixth most in the nation. But Illinois policymakers shouldn’t consider the job done—far from it. Illinois still burns an enormous amount of coal, causing thousands of serious health complications and hundreds of premature deaths every year—especially in lower-income communities and communities of color. The Union of Concerned Scientists conducted an analysis to gauge the public health, economic, and social equity gains that could result by replacing Illinois’ coal plants with clean energy. We found that the benefits far outweigh the costs—and that the sooner the replacement is done, the greater the rewards will be. Interactive feature: Coal in Illinois. The state’s coal plants are becoming gradually less competitive. Accelerating the closure of coal plants would decrease electric bills, while alleviating pollution. Closing plants before 2030—and replacing them with clean energy—would prevent significant numbers of heart attacks, hospital admissions, incidents of chronic bronchitis, and premature deaths. In many cases, plants could be entirely replaced by a combination of solar power, storage, and other grid technologies. 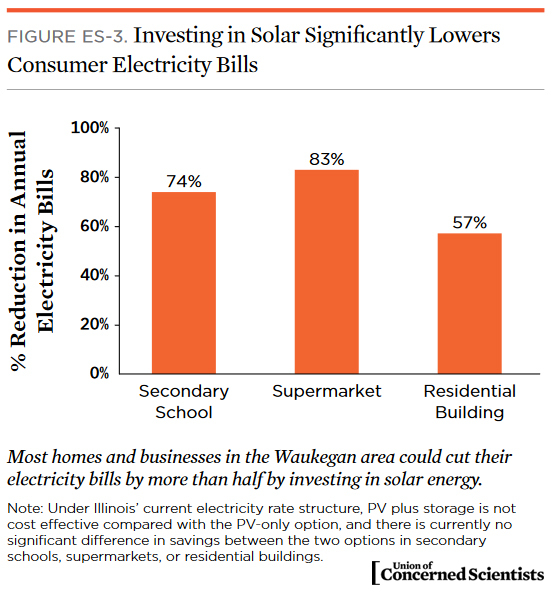 Solar could help most Waukegan homes and businesses cut their electric bills by more than half. Click to enlarge. 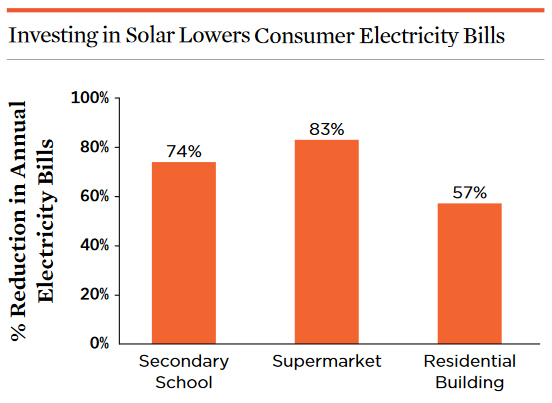 We also conducted five case studies to better understand how coal plants affect communities. The studies—which include three communities where coal plants have closed, and two where they haven’t—showcase the diverse range of impacts that many of these communities face, and highlight the central importance of stakeholder engagement. Community involvement is paramount. Meaningful engagement is essential for fully understanding the needs of local communities—especially as they undergo major transitions. Energy storage needs support. Illinois needs storage to support higher levels of renewables—and sooner is better. Rate structures matter. State utilities should take time-varying rates seriously, to reduce peak demand and encourage investment in solar and storage.